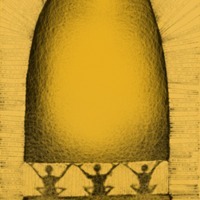 Three black-shaded humanoid figures hold up a dark yellow egg-shaped mound; underneath in a rectangle is a larger humanoid shape composed of calligraphy. 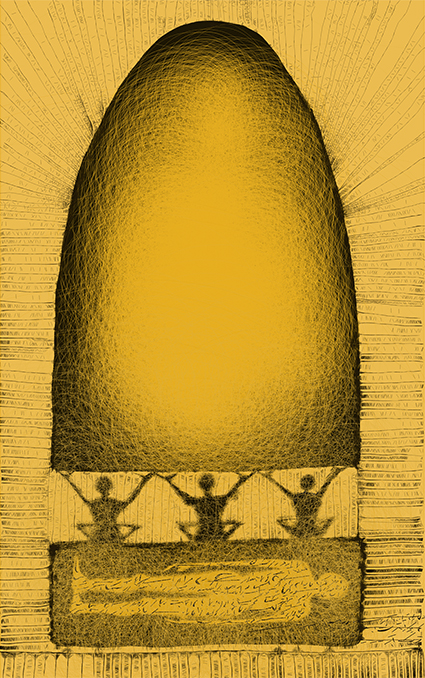 Lines of indistinguishable writing surround the image against yellow background. Majid Aslami, “untitled,” Peace Posters Dialogue Project, accessed April 23, 2019, http://peaceposters.oberlincollegelibrary.org/items/show/335.